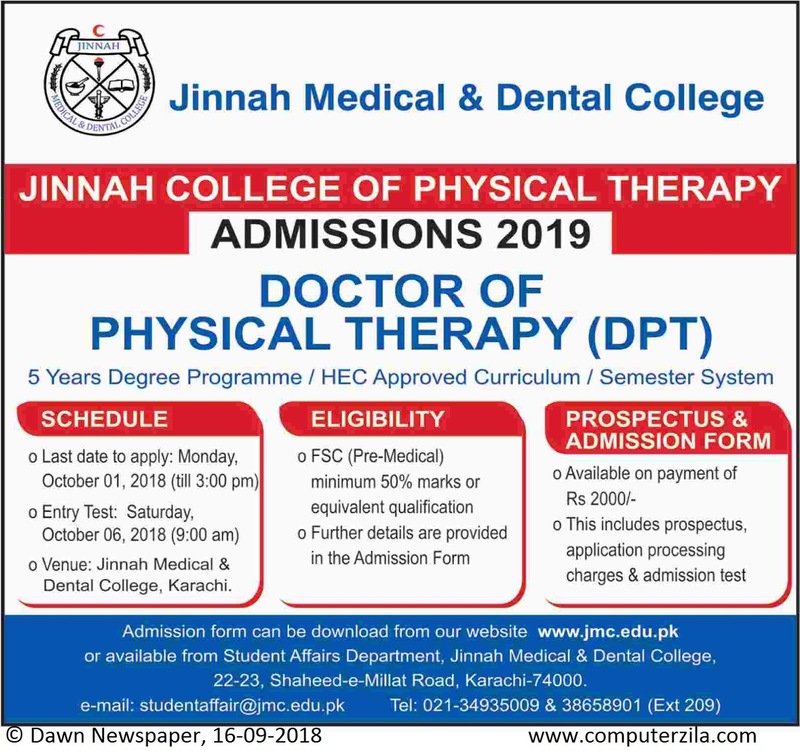 Admissions Open at Jinnah Medical & Dental College's Main Campus for the batch Spring 2019. JMDC offers admissions in different fields of study for Bachelor Programs. University DescriptionJinnah Medical and Dental College (Urdu: جناح میڈیکل اینڈ ڈینٹل کالج‬‎ or JMDC) was established in 1998 in Karachi, Sindh Pakistan. It is located in the heart of Karachi on Shaheed-e-Millat Road. The first batch of doctors and dentists graduated from JMDC in 2003 and 2004 whereas first batch of pharmacy graduated in 2009. The college is affiliated with the University of Karachi, which awards MBBS, BDS and pharm-D degrees to its graduates. Graduates from JMDC are eligible to sit for foreign qualifying examinations such as USMLE (ECFMG) and PLAB. To date, JMDC students have earned over 578 distinctions in MBBS subjects and over 348 distinctions in BDS subjects on the Professional Examinations conducted by the University of Karachi. It is also recognized by the Pakistan Medical and Dental Council. or ap admission form Jinnah Medical College k campus me ja kr bhi le skte hen.. Campus details oper di gai hen.. or form submit wahen hoga.